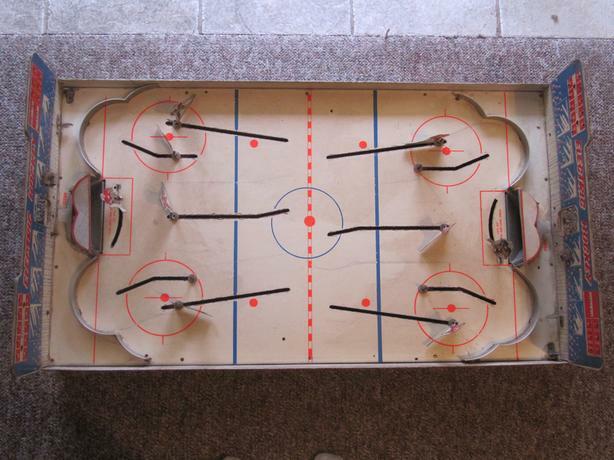 Rare vintage Munro "Hockey Master" game. ever seen just like this one. There is a scoreboard at each end that uses pegs. There is a flipper at each end to flip the puck out of the net. That is what the hole in each scoreboard is for--to reach through. It is electronic in that there should be a light bulb at each end but there are missing. I doubt it would work even with them but I'm sure someone with the expertise could get it working again. The rods all work fine. The teams are red and blue all star teams. There is a complete set of 6 red (goalie and 5 players). There are only 3 blue included (a goalie and 2 players). There are a total of 6 of the plastic "knobs" that fit on the end of the rods. The game is dirty in spots on the playing surface and especially on the side and end panels. I'm not sure how much can be cleaned up.